Because we buy more from people we actually like. There are a lot of things that you are taught when learning how to be successful in phone sales. But really – every person, and conversation, is different. That’s why CallSource records, scores, and coaches calls based on the principles of a good phone call instead of using specific scripts. So obviously, we preach more of these values than we do of the exact phrases you need to use in order to make a sale. And when it comes down to it, what you really need to be successful in sales is relationship-building and people skills. People like people who they like and who like them. It’s as simple as that. 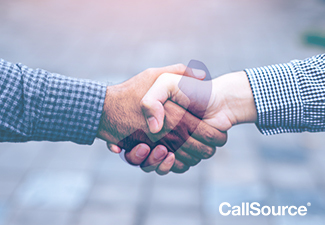 Building rapport with your callers is one of the most important elements of closing the sale or setting the appointment. Now, this doesn’t mean that you have to deep-dive and have an intense and profound conversation with your prospect. This conversation is ultimately still a transaction – you’re not mingling at a cocktail party. But, you do want to make sure that you can move through the phrases of the phone call by using rapport-building techniques and not simply reading off of a script or having no personality at all. Let’s take a look at two different possible conversation scenarios – one where the salesperson is building rapport, and one where they are not. Salesperson: Hello, this is [XYZ] Business. Caller: Hello, my air conditioner recently broke so I was wondering what the price of a new one is and how soon you could come out? Salesperson: We have a flat rate of $X to come out. What is your address? Salesperson: Hello, thank you for calling [XYZ Business]. My name is [Name], may I ask what your name is? Caller: Hi, my name is [Name]. Salesperson: Well hi there [Name], how can I help you today? Caller: Well, my air conditioner recently broke so I was wondering what the price of a new one is and how soon you could come out? Salesperson: Oh no, I am so sorry to hear that, [Name]. That must be frustrating. But we can definitely help you with that. First, let me ask you a few questions to get a better understanding of how we can best serve you. Now – this would be just a small sample of the conversation, but can’t you already tell with just a few added details how these are two totally different dialogues? Which company – and person – would you rather do business with? Having a personality and building rapport with your callers isn’t just a good idea when trying to make the sale – it’s necessary. It takes work to earn a consumers’ business; they aren’t just going to give it to you because they saw your ad or because you’re in the closest proximity. How do you stand out from your competitors? Your call handlers can make all the difference by just being personable and engaging. Just like you’d travel a few extra miles to go to the grocery store with the kind check-out clerks that may be a bit more expensive rather than the lower-quality, poorly-staffed store that may be closer to your home, people will choose your business over others if they feel that you truly care about them. Now that you know why rapport-building is so vital to your sales success, here is our free gift to you. Discover the 5 ways that you can easily build rapport with your callers. And let us know what other tips and techniques you have in the comments below!